It started out innocently enough. We had breakfast and prepared to go to Rose Garden, a cultural centre which showcases Thai traditions and arts and crafts. The driver was supposed to pick us up at 9am. After several calls by Lilian to the agency, the driver finally pulled in at 9.30am. We were a little anxious since the hands-on activities at Rose Garden only took place between 10am-12noon. But we were on our way! Or so we thought. The driver assured us that the journey to Rose Garden would take about 40mins so it seemed we were still in good time. However, for the next half hour or so, we inched forward in Bangkok traffic, including possibly 15mins at just one traffic light. Then, to our horror, we saw that we were heading back in the direction we started from! When quizzed, the driver replied, "oh, now I think maybe taking the highway is better." Don't ask me why the thought didn't occur to her right from the start. When asked what time she thought we would get to the Rose Garden, she started looking worried and said, "uhh... maybe 11am?" By then, we were pretty frustrated but the final straw came when she said, "I need to stop to go to the toilet." Gaahhhhhhhh. Kenneth threw a fit right there and noticed that we were driving by Platinum, the shopping mall that we'd planned to visit that afternoon, and insisted she dropped us there. Needless to say, she didn't get paid. The lesson is: give yourself a buffer and go with reputable transport companies! You pay more but at least you lower the risk of spoiling your holiday. The Thais are very gentle and friendly people but reliability is not their strong suit. Thank goodness with us, it happened for Rose Garden which was not one of our main attractions in Bangkok. Live and learn. Well, no point crying over spilt milk (gosh, see how many cliches I've used already!) so we decided to do early shopping at Platinum instead. Platinum is a mall which sells mostly clothes but also trinkets and accessories, all at wholesale prices. Lilian tells me there are ladies who can shop all day at Platinum and I can see why! There's something attractive in every corner and each floor is brimming with bargains. Lilian and her kids met us at Platinum, then we shopped some more before heading out to lunch. Lunch was at a Chinese restaurant at a fancier mall (can't remember the name). One thing I noticed about the malls in Bangkok is that they are all elaborately dressed up for Christmas, even more so than in Singapore. The highlight of this restaurant was the Peking duck. Thin and crisp, wrapped in pancake - it was absolutely yummy! The best part? The price - only THB 600 (about S$26). How do you beat that? With full tummies, we deliberated on what to do next. Since we'd missed out on our cultural experience this morning, we thought it would be a good idea to substitute it with another, instead of doing more shopping (which was starting to bore Andre to death). So on the spur of the moment, we decided to head out to Wat Pho. Wat Pho is Bangkok's most famous Buddhist temple and is home to the world's largest reclining Buddha. The Buddha is 46m long and covered in gold leaf. The feet themselves are 3m long. Here you can see the head and the feet. The temple grounds are very picturesque, with lots of ornate architecture. Interestingly, the Grand Palace is just across from Wat Po and from the exterior, the two looked the same! They both have the distinct Thai, temple-inspired look. 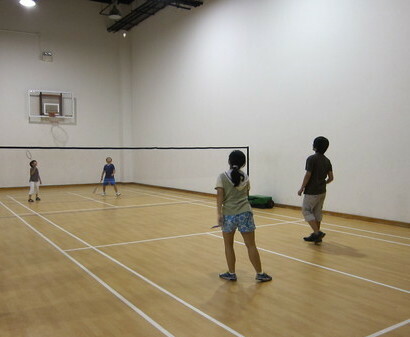 After the visit, we returned to Lilian's place for guess what... a badminton game! Andre was so envious that she has a badminton court right at her disposal. Of course he brought all his gear! Lilian invited her friend with her two sons to join in the game. Incidentally, in case you haven't guessed, Lilian's place was Andre's FAVOURITE destination in Bangkok. There were two main reasons for this: Xbox and Nerf. We have neither of these at home, Xbox being too addictive and Nerf because I don't allow any sort of toy weapons in my home. So Andre had a field day, playing to his heart's content. Here he is, shooting at imaginary enemies. And to top it off, the kids insisted they were too tired to go out for dinner so Lilian ordered McDonald's for everyone. Auntie Lilian, you are the best! Wah your photo-taking skill has improved by leaps and bounds...or is it cos Kenneth's the photographer here lol! We had loads of fun with you guys too. My kids miss having your kids here haha, cos when there's company they don't have to do any work at all, just play xbox all day! Wei, most of the good shots are mine! Haha, it's probably the camera lah. Andre has been looking at the photos of xbox and nerf, he probably wishes he was back there!